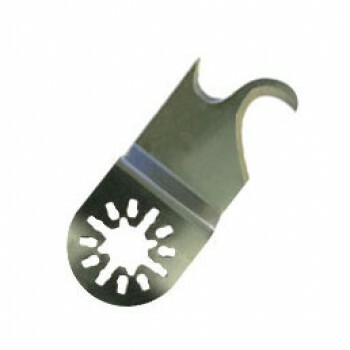 This speciality blade has an outward concave knife edge for push cutting and a curved hook blade for pull cutting of flexible materials such as carpets, asphalt roofing shingles, fabrics and cardboard boxes. Attention roofers: Use this knife to easily cut standard '30 yr asphalt roof shingles' using your multi-tool. This blade will cut faster than the time it takes to set your trim lines. Attention carpet Installers: Using this blade in your multi-tool will allow you to make straight, curved or complex cuts without the strains usually experienced with a hand carpet knife. It'll be easy to cut like a pro with this blade. Simply pull the carpet edge tight to help the knife to dig-in and then guide this cutter the rest of the way utilizing the machine's high oscillation speeds to slice through the carpet backing like butter. The step-down machine arbor connection allows the operator to lay this knife flush and true to a guide surface for controlled cuts. Special Alert for Dremel MM40 / MM45 model owners: Please be aware that this item and any of our other accessories, will NOT suitably fit your Quick Release Tool-less Blade change Dremel multi-tools. Use your multi-tool to cut materials such as carpet, asphalt roofing shingles, flexible vinyl and fabrics. This double curved edged blade has a unique push or pull cutting capability for added versatility.